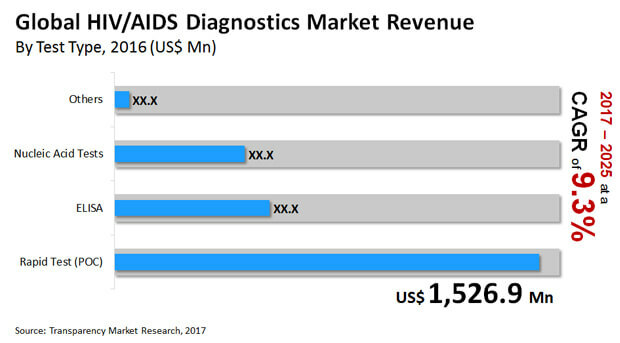 As per a report by Transparency Market Research, the global HIV/AIDS diagnostics market will likely expand at a 9.3% CAGR between 2017 and 2025 to become worth US$5.74 bn by 2025 from US$2.606 bn in 2016. Alarming rise in occurrence of HIV worldwide and the growing awareness about diagnosis is said to be the root cause of growth in the global HIV/AIDS diagnostics market. “A release by the Joint United Nations Programme on HIV/AIDS (UNAIDS) in 2015, showed that an estimated 36.7 mn people were living with HIV, and the prevalence rate of HIV was 0.8% worldwide. Most of the HIV-afflicted people live in low and middle income countries. To tackle the menace, government organizations and agencies are focusing on public awareness campaigns about diagnosis, treatment, and care,” elaborates the lead analyst of the TMR report.